Entertain in premium style! Surrounded by the splendor of lush grounds, with a sparkling pool and water view! This stunning home has it all! Private study with full bath has direct access to the Spanish style courtyard and large gathering area with fireplace. 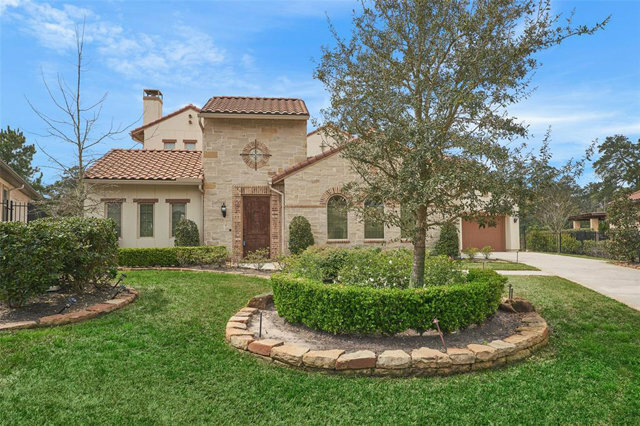 Elegant formal living with gracious rooms, custom beamed ceilings and beautiful fireplaces. Gorgeous chef's kitchen and sun filled morning room are strategically placed and well planned for entertainment.The Owners oasis provides perfect separation with a large sitting area and custom kiva inspired fireplace, luxurious bath with generous custom closets and private access to the pool/outdoor spaces. Upper level media and game rooms open to the expansive balcony for breathtaking views of the huge perserve and the home's outdoor living areas. An oversized pergola houses a huge outdoor kitchen, fireplace and large gathering area. No Flooding. Schedule a private tour of this amazing home today!